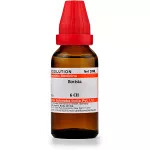 It is indicated for Skin complaints of eczema, urticaria, pimples all over the body, acne after summers, Excess use of cosmetics. 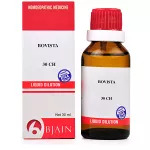 Bloatedness puffy condition of body surface and a sense of enlargement in all the parts is an indication of Bovista. It is indicated in ovarian cyst, warts and corns with shooting pains. Hemorrhage between the periods, Sensitive to touch, cannot bear clothing specially around the waist in females indicates Bovista. Colic relieved by eating indicates Bovista, colic which tends the patient to bend double. Bovista is indicated in patients who are awkward, having problem in speech, stammering children with weakness of memory. Tendancy to drop things with Misapplication of words in speaking and writing indicates Bovista. Sudden attacks of vertigo with sensation of enlargement of Brain and sharp pains. Eyes dull without brightness, Inflammation of eyelids with pressure in the sockets felt more during menses is relieved with Bovista. 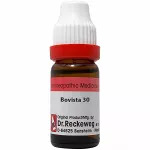 Ear eczema of, Ulcers in the ears, Boil in right ear with pain on swallowing, Oozing of fetid pus from the ears, Itching in the ears is relieved with Bovista. Scurfs and crusts about nostrils, Stoppage of the nose with fluent coryza, Nostrils scabby, with burning pain is recovered with Bovista. Lips chapped with bleeding gums, Cheeks and lips feel swollen. 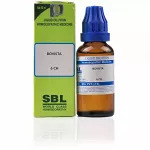 Acne worse in summer and due to excess use of cosmetics is relieved with Bovista. Corners of the mouth ulcerated with Sore throat, scraping and burning pains. Great dryness in throat. Hungry, even after meals, with Sensation as of a lump of ice. Abdominal colic relieved after eating, shooting in the abdomen accompanied by the voiding of red urine better by eating. Frequent desire to urinate, even immediately after urinating indicates bovista. Flow of blood during the intervals, between the menses with flow only at night. White dischage before or after few days of menses is seen in patients of Bovista. watery stools before and during menses, soreness of pubic region during menses is relieved with Bovista. Cannot bear tight around waist. Urticaria, pimples covering the whole body leads to this remedy. Warts and Violent shootings in corns indicates Bovista. Eczema, moist; formation of thick crusts. Blunt instruments (scissors) make deep impressions in the skin of the fingers. Perspiration in the arm-pits, smelling like onions is an indication of Bovista.